If you work in logistics, you may have noticed that you had to pay entry level warehouse workers more to start this year, and that even with the extra pay you had more trouble filling your ranks than in the past. Being short-handed may have left you struggling to meet quotas or perform compliance checks on the goods you shipped. Higher labor costs, higher demand, and tighter regulations have been recent supply chain trends, and they show no signs of tapering off. In order to deal with increased costs and improve process controls, logistics managers are looking to automation. However, fully automating a warehouse has one big drawback: it requires outfitting the building with conveyor belts, aisle cranes, and tracks. All of this equipment represents a significant investment, and installing it will put your warehouse out of commission until the job is done. However, there is an alternative in the form of autonomous guided vehicles (AGVs), which are growing more reliable and less expensive. Implementing AGVs in the warehouse doesn’t require as much infrastructure as an Automated Storage and Retrieval System (ASRS) would. They can also be used in conjunction with an ASRS or for only a portion of your warehouse processes at either the container or the load unit level, making them highly adaptable for different product supply chains. Compact: This is a small AGV that is just big enough to do its job. Compact AVGs in the warehouse resemble oversized Roombas. The most common type park themselves beneath product racks and lift the whole rack with a hydraulic piston on their upper surface. They’re mainly suited for use with small containers. Standard: A standard-sized AGV is comparable to a narrow aisle forklift, and usually has a similar array of attachments like forks, clamps, and rollers. This size category of AGV is suitable for moving bulk quantities of goods at the unit level. Custom: Some products may be very large or unusually shaped and can’t be handled with typical loading equipment. For a cost, standard AGVs can be modified to handle unique parameters with custom hardware and programming. Hybrid: Some companies need to be able to grab an AGV out of its pre-programmed routine and use it for human-directed activities. A hybrid AGV has both automated guidance systems and manual controls designed to be used by an employee. A company implementing an AGV warehouse process may want to consider a few of these for generalized use. Make sure the AGV you choose is able to integrate with your floorplan, existing processes, and the rest of your supply chain. The type of AGV most relevant to you depends largely on what type of product you’re moving and what part of the warehouse you wish to automate. 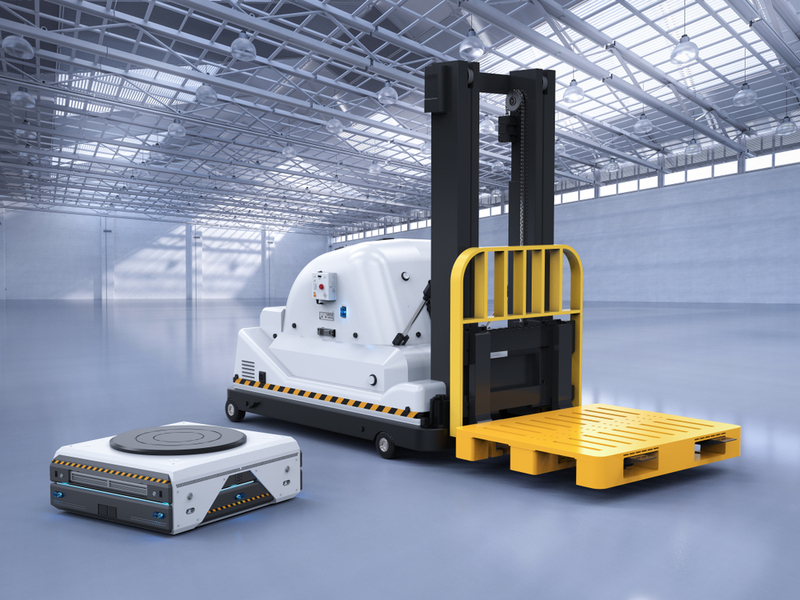 A compact AGV might be ideal for moving containers of goods from a processing area to a packing area, but won’t be able to move those goods when they’re packed on pallets. A standard AGV equipped with a forklift may be useful in multiple areas of the warehouse, but too industrial to go into food or pharmaceutical processing areas. Make sure the AGV you choose is able to integrate with your floorplan, existing processes, and the rest of your supply chain. The first step to bringing AGVs into the warehouse is to consider the processes that you can reasonably automate with an AGV and build your implementation plan around those. If your company specializes in small batch orders sent directly to the consumer via package, a compact AGV might work best to run batches from manufacturing to packaging. If the warehouse in question specializes in large loads as part of a nationwide distribution network, then standard-sized AGVs equipped with forklifts are likely the best option. Choosing pallet-based AGVs guarantees interoperability across your supply chain and as your company expands into new markets. Whichever you pick, you’ll want to keep in mind that choosing AGVs that aren’t able to work with pallets will likely create an extra step in the supply chain since at some point products will have to be palletized before they can be delivered to market. Choosing pallet-based AGVs guarantees interoperability across your supply chain and as your company expands into new markets. It also means that you can reuse the automation plan for one warehouse in other warehouses with minimal adjustment. Pallet-based warehouse automation does come with its own challenges, however. Built-In Tracking: Some high-quality plastic pallets come equipped with a Global Returnable Asset Identifier (GRAI) number that can be used to track the pallet through the supply chain. It can be read by AGVs either by scanning or radio frequency identification (RFID). Durability: A plastic pallet is tougher than a wood pallet and capable of making 80-100 trips through the supply chain, while a wood pallet has a lifespan of only about 20 trips. Greater durability translates to greater reliability, which is important for automated systems that operate without constant human oversight. Consistency: As an engineered product manufactured to meet exacting standards, plastic pallets are consistent in both weight and dimensions and, without loose boards or protruding nails, are easier for pre-programmed AGVs to handle. Interoperability: Along with all of the automation-friendly features listed above, plastic pallets meet Grocery Manufacturer Association (GMA) specifications, ensuring that loads are interoperable across the entire supply chain whether it’s fully automated or not. Implementing AGVs in your warehouse should involve considering how AGVs will interact with existing processes and equipment. The wood pallets found in most warehouses were developed to work with human-operated forklifts, and don’t have the reliability or consistent dimensions needed to operate satisfactorily within automated processes. As you invest in warehouse automation, consider a durable, precise plastic shipping platform to get the most out of your AGVs. The iGPS plastic pallet pool provides a consistent, GMA-spec plastic pallet with a GRAI number readable via scanning or RFID. To ease the transition to automated systems with iGPS plastic pallets, give our team a call at 1-800-884-0225, email a specialist at switch@igps.net, or visit our contact page.